Optimize your space with Prepac's Designer Floating Desk. Perfectly suited for any home office, den, living room, kitchen or bedroom. The stable work surface is ideal for any computer or simply as a place to get your work done. A rear flip-up door conceals a storage compartment that is ideal for power bars and adapters. No more messy wires cluttering up your workspace! Installation is a breeze for this wall mounted desk with Prepac's innovative hanging rail system. Proudly manufactured in North America using CARB-compliant, laminated composite wood. Ships Ready to Assemble, includes an instruction booklet for easy assembly and has a 5-year manufacturers limited warranty. 73Ci 100% Jam Proof Cross-Cut Shredder is rated 4.8 out of 5 by 17. Rated 4 out of 5 by Evolve from Easy to use! I purchased this shredder as I was frustrated using a small portable shredder. I have been very pleased with the extremely quiet performance of this machine. It has not jammed, and I have not had the shredder overheat or stop working as yet, even though I was using the feed for a while. The feed operates very smoothly. I would highly recommend this machine as it is functional and versatile. Rated 5 out of 5 by SciTechLib from Great shredder! We have only had this shredder a short time in our office, but so far everyone loves it! It is much quieter than our old shredder and works every time you want to shred something! We appreciate its ability to shred several pages at once as it speeds up the process. So far, so good! Rated 5 out of 5 by ShellyShredder from Worth the Money pleased with my recent purchase. like the design: on castors so easy to move around; paper bin pulls outward for ease of emptying it. in the past, bought cheaper shredders but they don't last. Rated 5 out of 5 by Sunseeker67 from Best Shredder Ever Purchased! 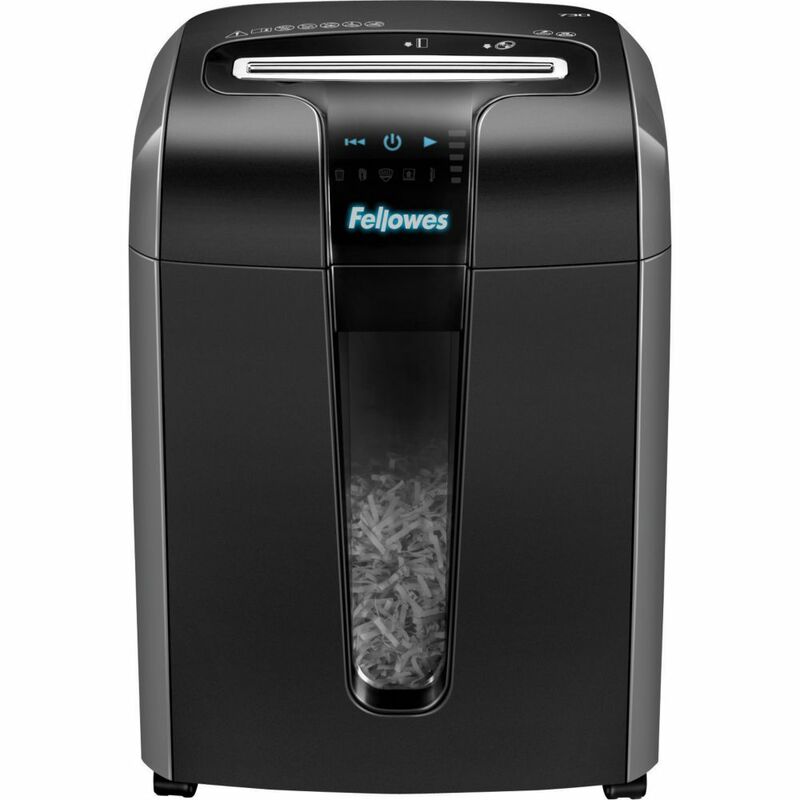 I have owned many shredders throughout the years and this Fellowes shredder is by far the best i have ever purchased! My old shredders would jam so easily, were not very good quality, and were very unreliable! However, this Fellowes shredder is definitely worth the money! It makes shredding less of a chore because it is so simple and convenient to use, it is quite literally hassle free! The quality of this shredder is top notch and it requires little to no maintenance! Definitely worth the money! 5 STARS! Rated 5 out of 5 by Cerco from Great home office shredder Just used my shredder for the first time. I was pleasantly surprised how quiet it is (compared to my old machine - dead after more than a decade). There is a lot to like (style, quality, safety, jam proof, etc). I wish the bin was a bit bigger and it could cut more paper at once, but this is a good compromise between cost and features. The shredder is placed in my home office and will be used daily. I'll just have to empty the bin a bit more often, no big deal. One thing that worries me a bit is the size of the shred. My previous machine did a great job of making the bits of paper unreadable. This one, given time, could be paste back together. Again, this is for my home office and I believe the size is enough to discourage the stealing of information. So all in all, a very good purchase. Rated 4 out of 5 by BosonRider from First Impression. Easy to unpack and assemble. Worked fine from onset of operation. So far, so good. Note: just how much oil to use would be a good addition to the information leaflet. FPS. Rated 4 out of 5 by SugarMan from A good desk side Shredder The shredder is good for a desk side use. the cut size is perfect for me because I do shred a lot of sensitive information, so it is secure. The build of the deposit bucket could have been better, but it is what it is. Also, it does make a mess. The number of sheets at a time is reasonable but if you put more paper it starts to speed up and the noise level goes up. I am not talking about 12 or 13 (maximum capacity, I am talking about even 5 or 6 sheets together and it cranks up the speed and the noise. Overall, I am satisfied because I have a shredder in my office all for myself.